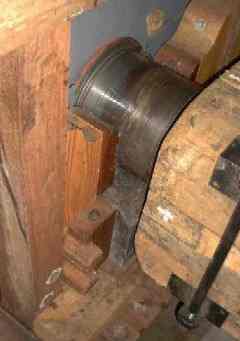 Brake wheel, brake, windshaft, pal, wallower in windmill cap. 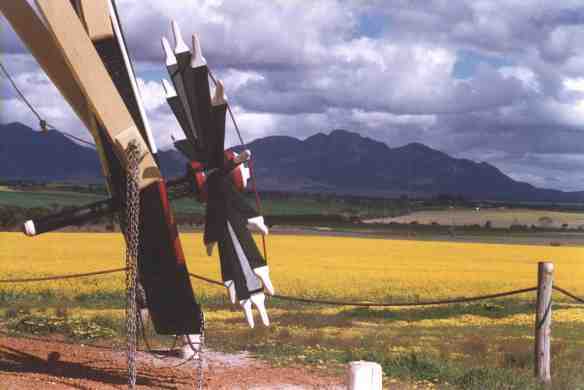 Built Between 1991 and 1997. Type 16th Century design circular brick ground-sail mill. Location Chester Pass Road, 10 km north of the Stirling Ranges. 95 km north of Albany, Western Australia. Proprietors Pleun and Hennie Hitzert. Assembly of the sails, Sjors Adriaens and Pleun Hitzert, 1997. Floors Cellar, meal floor, stone floor, hoist floor and cap floor. Walls Bricks, handmade around 1904. Brick size 230 x 110 x 76 mm approximately. Cavity filled with concrete and steel. Wall thickness Between 550 and 600 mm overall. Window and door frames Wandoo, recycled Telecom cross-arms. Jarrah, recycled or custom made. Floors Ex-Telecom Karri wood cross-arm 75 mm wide x 75 mm thick. Ex-Telecom Whitegum wood poles and Albany deep water jetty beams. Cap cover Wood, steel and fibre glass. Mainly Karri wood and some Jarrah wood, recycled from the old Albany deep water jetty which was built in 1916 and demolished in 1993. Beard Oak. "The Lily" ANNO 1997, dark green, yellow and white. 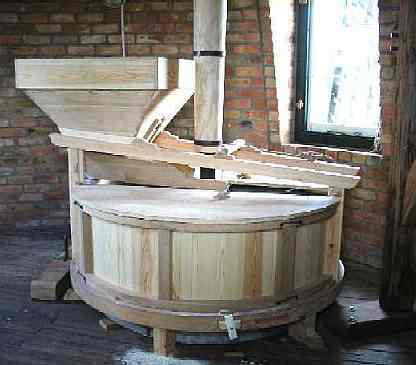 Made and donated by Sjors Adriaens, Millwright, Weert, The Netherlands. Cap flag pole Oregon wood, originated from the previous Esplanade Hotel Albany which was demolished in 1991. 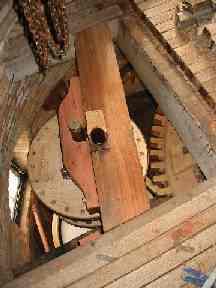 Weight Cap and gears without sails and tail approximately 11.5 ton. Including sails and tail approximately 22 ton. Upper side girt Oak, 32 x 35 cm x 12 metres long. 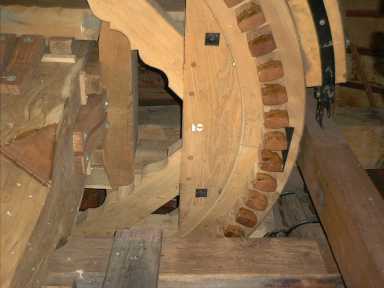 Windshaft Oak (France) with cast iron (Optimiet) Banister or Poll End. Length Between tail-end and waterhole: 4.7 metre. Tail end Metal cap over oak tail. Bearings neck and tail Natural stone. Stocks Steel, model "Pot", made by the Weerter Scheepswerf, The Netherlands. Sails Russian Larch (larrix) for the lattice, Oregon wind-boards. Sail form "Old Dutch", canvas material WK 77, dark brown. 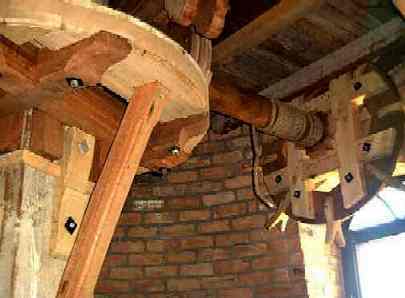 Upright shaft, spur wheel, Jarah support on stone floor. Brake wheel Pitch 2306 mm between teeth 115 mm, 63 teeth, outside diameter 2600 mm. 4mm steel lining. Kept in position with 16 oak wedges. Wood used, Oak and Elm for wheel, Accacia wooden teeth (kammen). Flemish model, wood is "Canadas" wood similar to "Populus". Cross section 180 x 250 mm x 2.6 metre diameter (inside). 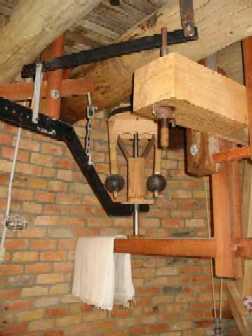 The brake is located above the sheers and operates via a "brake drum". Also used is a "kneppel" and "pal". The kneppel is to secure and reinforce the brake. The pal is to prevent the sails turning backwards. All parts can be activated from ground level as well as from inside the cap by means of a steel cable, manila rope and chain. Upright shaft Karri 350 x 350 mm, bottom bearing tapered rollers, top-bearing steel shaft (80 mm) in wooden "groenhart" bearing, lubricated with pig fat. The upright shaft is suported on two Jarrah beams originated from the old Albany deep water jetty. Wallower Lantern Pinion, tapered, 29 staves - 300 mm long, pitch 1062 mm. Wood: Blades: -Elm, Staves: -Bulletree. 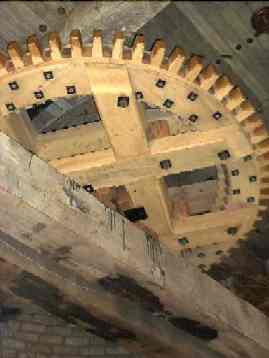 Spur wheel Pitch between teeth 95 mm, 66 teeth, pitch 1996 mm. Materails used: as brake wheel. Lantern Pinion, 24 staves (green heart) - 250 mm long, pitch 786 mm. Grinding stones 1.4 m diameter. * One turn of the sails makes the stones go 6.49 turns. Tail Is an old iron stock, made in The Netherlands around 1880 by a company called "Pannevis" in Oude Kerk aan de IJssel. This was one of the earliest riveted iron sails. Iron sail eventualy replaced virtually all timber sails all over the country. One of the reasons for this was the chronic shortage of good long timbers. 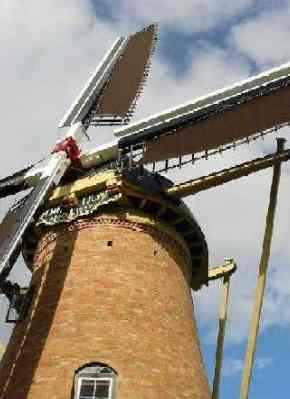 This stock originates from Windmill "Landzigt" in Zuid-Bijerland, the Netherlands. Track 36 tapered steel rollers with flanges, running between the top and bottom steel track. Mean radius track 2070 mm, 70 mm wide, bottom 40 mm and top 25 mm thick. Capstan Wood (white-gum) and steel, 2.2 metre diameter, 14 Jarrah spokes. Anchor poles 12 x ex Telecom poles, white-gum.